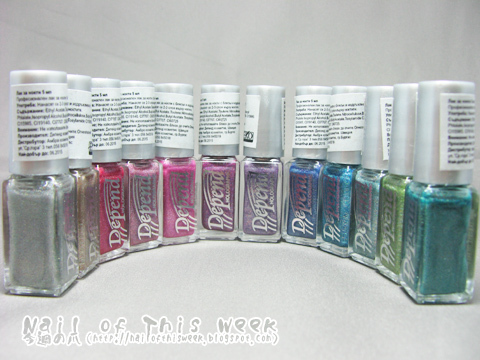 Swatch: Depend Holographic Nail polish Part 1 : Nail of This Week. So as above shows each color number & name; I’m going to show each swatch by numeric order. And as they have 12 (!) colors, if I show all the swatch once it’ll be SUPER pic-heavy; I’m going to divide all in 3, so today I’m going to show 4 colors from 2025/Silver to 2028/Heather Pink. 2025/Silver. 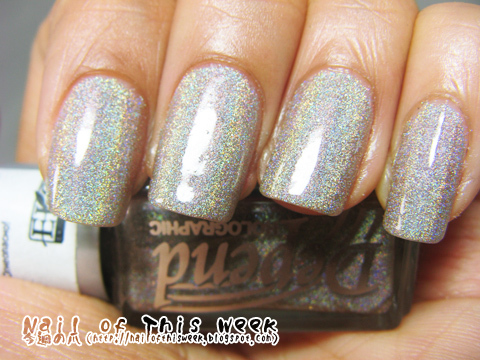 Cool white silver holo. As you can already notice here, all Depend’s holo is not the super-duper holo as legendary GOSH/Nfu-Oh bling-bling holo, but it still show pretty enough linear rainbow effect. Actually this one seems to be clear polish with holo particle ALONE and no other color pigments; it applies super sheer so maybe better to give 4th coat for stronger color & effect. 2026/Sand Gray. 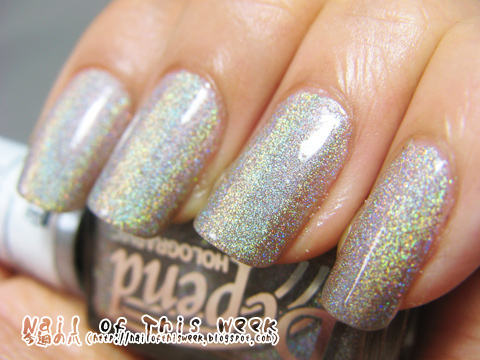 Pale white-gold holo. Not as gold as the official image or bottle color, much appears very silvery; but still much warmer than 2025/Silver. It also have better coverage than 2025/Silver, VNL is completely covered by 2 coats but better to give 3rd coat to get stronger color as the bottle color. 2027/Raspberry. Berry-like warm red-pink holo. Though official image looks much like “dark red” and otherwise present pic showed as a bit blue-ish pink, it appeared as sweet vivid warm pink. Showed great coverage with nice holo effect, 2 coat was already OK; adding 3rd coat can be depend on one’s taste. 2028/Heather Pink. 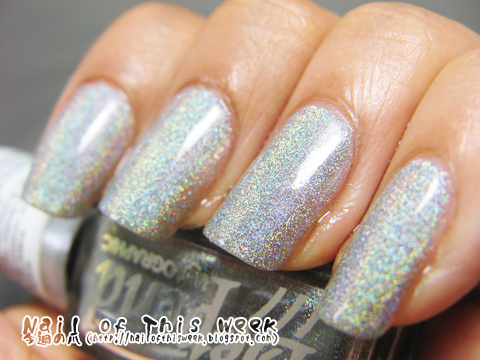 Gray-ish cool-toned light pink holo. Because it’s pale pink, I was expecting this will be most boring color in all…and NOT. In fact there’s clear tendency that if base color is light holo effect will be dulled and vice versa, but this one is exception. I LOVE THIS. Base color is still not too vivid, so seems to be another office-friendly holo, I think :) OK with 2 coats, but better 3rd coat. Brush was good, formula was SUPERB, and was topcoat friendly. 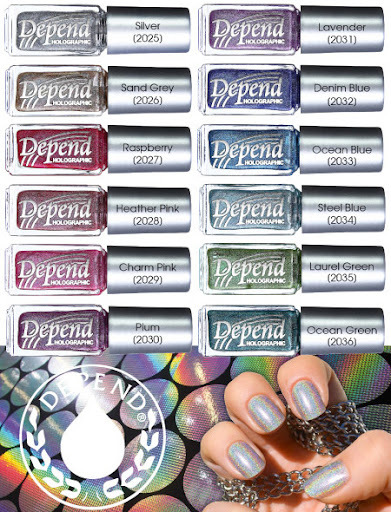 I just fell in love with Depend’s polish…can’t wait to show rest of them, they’re all AWESOME. oh raspberry looks awesome!! great post!! 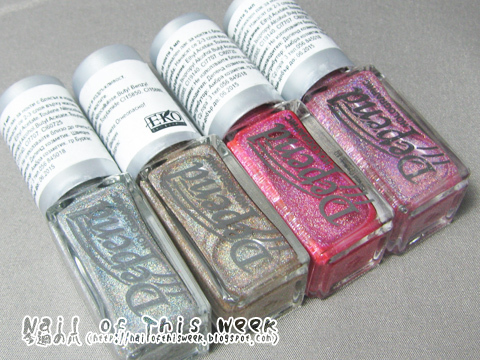 Beautiful swatches, Raspberry is gorgeous! I´d be very interested in that since shipping (and taxes) usually is the one thing that keeps me from ordering stuff from other countries. It was 2.64EUR each plus shipping (14EUR). And they are really nicely packed, it came in ITS OWN transferring plastic box that polishes fit perfectly! OH EM GEE!! These are awesome!! I love how the holo effect is a bit more subtle than some of the others. I'm going to have to find someone to mule a few of these over to me in the US! That's my fav point too, it's not super-duper metallic bling-bling but just pretty accent for each pretty colors <3 Recommend! Oh I love these how awesome!!! I have one question....where can I buy these?? Even it's not written on the website, they accept Paypal!